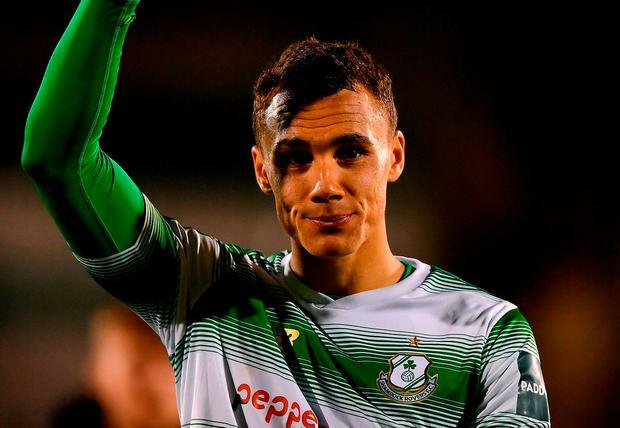 Graham Burke had cause to celebrate for the second time in two days as he marked his senior Ireland call-up with another goal, a vital one, for Shamrock Rovers to earn them a point at home to Waterford. On Thursday, Martin O'Neill named the 24-year-old forward in a 40-man squad for a series of three games, starting with the Scott Brown testimonial in Scotland on Sunday week, and on Friday night Burke came up with the goal, a scrappy one but an important goal all the same, allowing Rovers to claim a point at home to the Blues in front of 2,349 supporters. An off-colour Rovers had gone behind thanks to a long-range strike from Waterford midfielder Gavan Holohan which caught keeper Tomer Chencinski by surprise on 38 minutes, Rovers unable to trouble Blues keeper Lawrence Vigoroux to that point as the high-flying Blues were on top for long spells, Paul Keegan and Bastien Hery running things in midfield. Rovers boss Stephen Bradley reacted with two half-time changes, bringing on Dan Carr and Brandon Miele as the side reverted to a flat back four, and it was Carr who did the hard work to get them their equaliser on 74 minutes, bustling down the left wing and sending in a cross which was met by the unmarked Burke at the far post. Aidan Fitzmaurice Shamrock Rovers remain top of the league table but Bohemians will argue that they are, today at least, the kings of Dublin after yet another win for the northside club in a pulsating derby. Aidan Fitzmaurice BOHEMIANS kept up their remarkable record against deadly rivals Shamrock Rovers with yet another win at Tallaght Stadium in a pulsating Dublin derby.